Hey everyone! Today I have Allison of The Allure of Books here to talk about some of her swoon-worthy moments. Take it away, Alllison! 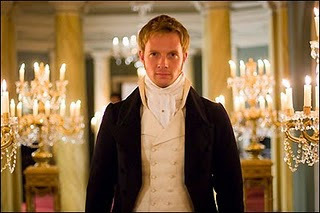 Captain Wentworth from the 2007 Persuasion adaptation - he cleans up quite nicely. This movie isn't going to make my list because the climatic scenes are kinda awkward (in my opinion). but I couldn't leave him out completely! Okay now, let's talk movie scenes. So, those are a few of my favorite movie moments. Make sure and comment telling us what you think of my list and what your favorite moments are! Thanks very much to Liz for letting me stop by! Thanks so much for stopping by, Allison! Be sure to stay tuned, because you'll be seeing some of my own swoon-worthy moments very soon, as well as those of one other blogger. Well, you knew I wouldn't be skipping this freaking awesome post! I agree with you on every single moment. Although for me and the newest P&P, my favorite scene is when Mr. Darcy is walking across that field in the mist. Holy Lord, that's amazing! I usually slide off my seat and somehow manage to make it back to sitting as he finally approaches her. I love it! But, that is now all overshadowed by my absolute obsession with Mr. Thornton and the "Look back at me" scene and the last scene of the movie. I honestly don't think it gets more **swoon worthy** than that! And, ohhhhh, I love that picture of Capt. Wentworth. I love the newest P&P version - the 'arguing in the rain almost kiss' is totally swoon worthy - But did you know the clip you selected, the kiss at the end, isn't in the British version of the film? (It certainly isn't on my DVD) It was done for America, apparently! After the North & South coverage I think I might have to find myself a copy, looks so good! BBC do period drama type things rather well - I'm totally in love with their most recent version of Jane Eyre. I'm not sure the upcoming film will be able to live up to the understated power of Ruth Wilson with Toby Stephens! i agree with your persuasion comment. although i like the looks of that captain wentworth, the kiss (on his part) was lacking.